Welcome to the city of Buffalo Neighborhoods Map. The "City of good neighbors" consists of thirty-two neighborhoods varying in size, function, and historic significance. These current neighborhoods are described by location within the city, community associations, and cultural and ethnic history. Additional features of this page include links to related sites and a selected bibliography of source materials used in compiling the Neighborhoods Map website. Situated between Virginia St and North St, Allentown is one of buffalo's most beautiful, diverse, and unique neighborhoods.Known for its historic houses, trendy bars, and artsy shops, Allentown isan expeiriance. The neighborhood centers on Allen Street, from Main Street to Symphony Circle. It is adjacent to the theater district of downtown Buffalo on the south. Street boundaries: Virginia, Main, North, College, Allen, Park, Elmwood, & Delaware. Elmwood Village Charter - 124 Elmwood Ave.
Tapestry Charter School - 40 North St.
Latin American Institute - 115 Elmwood Ave.
Karpeles Manuscript Library Museum -220 North St. Many representative styles of architecture appear with a variety and flavor that is common in this neighborhood. The Allentown Neighborhood dates back to 1827, when Lewis Allen purchased 29 acres of farm land. The now popular Allen st, was once Lewis Allen's cowpath. Since then Allentown has been the residence of many famous Buffalonians such as, Millard Fillmore and Samuel L. Clemens (Mark Twain). In 1901 Thoedore Rooselvelt was inaugurated President at the Ansley Wilcox Mansion on Delaware avenue. Allentown has become one of the country's largest historic preservation districts because of it's amazingly large collection of unique American architecture.By the 1950's Allentown was in decline, but talkof a smalloutdoor art show was the beginning of a beautiful future for this neighborhood. Allentown is listed on the National Register of Historic Places of the U.S. Department of the Interior. Notable in the area is the Theodore Roosevelt Inaugural Site (Wilcox Mansion), important for both its historical and architectural significance. The site also maintains the Wilcox gardens, which surround the mansion. On the first Friday of every month Allentown's Art Galleries, Restaurants, and businesses enjoy visitors for rich cultural events. Every year in June, Allentown holds an Arts Festival that shows off the communitie's arts, crafts, and goods. Book stores are among the selection of shops that add to the neighborhood perks. According to the Allentown Association, it is a "neighborhood of ethnic and lifestyles diversity." A center for the visual, performing and culinary arts, the area is well-known for its many art and antique galleries and restaurants. The annual Allentown Art Festival started in 1959 and brings thousands of Western New Yorkers to this old Buffalo neighborhood. "Rust Felt Books encompasses theessence of Allentown. If you want to know Allentown, go to Rust Felt Books." --Resident comment. Shops, galleries, and specialty stores abound. "People come here to get away from the hustle and bustle of typical social scenes… which actually makes allentown a huge social scene in itself. You'll find all sorts of people here." --Molly Brinkworth owner of "Pink"
Photographs with "1" in lower right by Rachael Hickson and Andrea Kaptein, who also supplied portions of the text. This Buffalo neighborhood centers on the intersection of Bailey Avenue and Lovejoy Street. As a part of the larger East Side, the area extends north to Broadway, south to William Street, and to the city line on the east with the village of Sloan. In Buffalo's industrial history, this was the site of extensive railyards and repair shops for the New York Central Railroad. These are views of typical streets in this neighborhood. Mature trees form shady streets. The Bailey-Lovejoy area is a neighborhood near the boundary with the suburban town of Cheektowaga. This Buffalo neighborhood centers on Hertel Avenue and Niagara Street along the Black Rock Canal. Delaware and North District--BlackRock Riverside NHS 716-877-3910; 203 Military Road. Black Rock takes its name from a black limestone formation on the Niagara River near School Street. The rock was removed in 1825 during the digging of the Erie Canal. The Black Rock Canal Lock (1909-1914) diverts water traffic away from the powerful currents of the Niagara River, providing safe access to the Erie Canal and Lake Erie. The neighborhood began as an independent municipality along the eastern bank of the Niagara River. It was incorporated into the city of Buffalo in 1853. The nineteenth century saw a great development of commercial and residential properties due to both the Erie Canal lock and the railroad system which criss-crossed the community. Prominent architectural monuments in the area include the Romanesque - style church of St. Francis Xavier (now the Buffalo Religious Arts Museum) and the Classical Revival-style Unity Temple on Niagara Street. See: photos and article on the church. Hertel Avenue east of Elmwood Avenue. This Buffalo neighborhood centers on Depew Avenue and Morris Avenue, between Main Street and Parkside Avenue. The south edge is the north side of Amherst Street. Early in this century, some of the largest and most expensive family homes were built in this neighborhood. There are several churches and the Central Park United Methodist Church dominates the neighborhood. This Buffalo neighborhood centers on Michigan Avenue close to the intersection of Main Street and East Utica Avenue. This area is a small part of the larger East Side of Buffalo. This Buffalo neighborhood centers on Delaware Avenue from the Scajaquada Expressway south to North Street. Ferry Street runs across the center of the district; a large residential area lies east of Elmwood Avenue. Delaware Park is the centerpiece of a city-wide parks system designed by Frederick Law Olmsted. The park is a green haven in the city offering meadows, gardens, trails, Delaware Lake, the Buffalo Zoo, and recreational facilities. In the summer it hosts "Shakespeare in the Park," the second largest open-air Shakespeare festival in the country. Adjacent to Delaware Park is Forest Lawn Cemetery. Listed on the National Register of Historic Places, the cemetery is known for its park-like beauty and outstanding examples of memorial sculpture. Many 19th & 20th century notables, including Civil War generals, famous inventors, and others, are buried here. President Millard Fillmore and Seneca Chief Red Jacket are among these. (See also: the Nation's Best Historic Places to Visit). Temple Beth Zion is a contemporary architectural monument featuring stained glass by Ben Shahn. The Pan-American Exposition (1901) was sited on the Western/Northern end of the Delaware neighborhood. Beautiful and often stately homes dating from the turn of the century surround the park. Many of them have been converted to organizational or corporate headquarters; for example, the Clement House, donated in 1941 by Carolyn Tripp Clement, to the Greater Buffalo Chapter of the American Red Cross. Also in the Delaware District is the Albright-Knox Art Gallery, world-famous for its modern art collection. Millard Fillmore Hospital at Gates Circle. Running through parts of the Delaware District, Elmwood Strip, and West Side are the Soldiers Circle, Bidwell Parkway and Chapin Parkway. These Olmsted-designed parkways cross over many parts of Buffalo. Buffalo's Downtown has distinguished itself with buildings of great architectural beauty, diversity and prominence. Notable among them are City Hall, the Prudential (formerly Guaranty) Building, St. Paul's Episcopal Cathedral, Ellicott Square Building, Old County Courthouse, Shea's Buffalo Center for the Performing Arts and in more recent years the Marine Midland Center and Arena. The addition of the Metro Rail and renovation of many of these landmark buildings is revitalizing the area as a center of commerce, recreation and historical interest. Once a bustling commercial harbor, the picturesque waterfront area has enjoyed recent redevelopment, bringing many people to its marinas and parks. The Buffalo & Erie County Naval Servicemen's Park offers tours of retired naval ships. This Buffalo neighborhood lies east of Downtown Buffalo. This huge area extends five miles eastward to the city line. The main streets are Genesee, Sycamore, Broadway, William, and Clinton. Bennett Park (Olmsted park that no longer exists). East Buffalo Community Ownership, 1981 Broadway. Map of Broadway-Fillmore Neighborhood. (Appendix A). Intensive Level Historic Resources Survey of the area as part of a Buffalo City study by Preservation Board. This Buffalo neighborhood centers on Elmwood Avenue from Forest Avenue south to North Street. The Elmwood Strip is located in the western half of Buffalo in between the West Side and the Delaware District, with Allentown to the south and Delaware Park to the north. "The Strip" stretches on Elmwood Avenue between Forest Avenue in the north and Virginia Street in the south. While the whole of Elmwood Avenue is 7 miles long, what is called The Elmwood Strip is about 2.1 miles in length. The Elmwood "strip" commercial district includes a variety of cafes, ethnic restaurants, nightclubs and specialty shops catering to neighborhood residents and the students of nearby Buffalo State College. The blocks running off of Elmwood Avenue are lined with fine examples of residential Victorian architecture. Leaded glass windows and wooden "tracery" embellish these older single and multiple family houses. In 1850, what was then known as Johnson Park developed as an elite residential area in the southern part of Elmwood Avenue and was considered the most exclusive part of the city. The rest of Elmwood, just north of Johnson Park was secluded from the city. This part was called Shingletown and was not yet urbanized. From 1880-1900, the overall population of Buffalo began to increase and the whole of Elmwood became more residential. In 1900, the Elmwood Avenue and Johnson Park area was home to Buffalo’s first mayor, Ebenezer Johnson. It was an upper class community, located just outside of the center of downtown Buffalo. The Buffalo Female Academy was the most selective school in Buffalo. Johnson Park, running on an east-west axis, blocked movement of downtown Buffalo and the central business district. The Common Council decided to split the park in half and Elmwood Avenue was extended into the heart of the city. Plum Pudding, 779 Elmwood Ave.
Everything Elmwood, 740 Elmwood Ave.
Spot Coffee, 765 Elmwood Ave.
Holiday Tree Lighting Ceremony: Celebrating the commencement of the holiday season, complete with caroling, hot chocolate, and cookies. Albright-Knox Art Gallery: World renowned art gallery that includes large collection of modern artwork. “A Musical Feast”- A music festival on Sunday, November 14th with many musicians including classical and contemporary artists. Carriage Rides: ride around Elmwood Strip with the family in a horse drawn carriage during the holidays, $25 per ride. Photographs with "2" in lower right by Jeff Malone, Leah Swartz, Michael Longley, who also supplied portions of the text. This Buffalo neighborhood centers on the intersection of Fillmore Avenue and Main Street. Leroy Avenue runs east to west across this industrial and residential neighborhood. Fillmore-Leroy Area Residents, 307 Leroy Avenue. Buffalo has many churches that are significant in the city's architectural history. One of these churches is the Blessed Trinity Roman Catholic Church on Leroy Avenue. Designed by architect Chester Oakley and built from 1923-1928, this church, according to "Buffalo Architecture: A Guide" (MIT Press, 1983), exemplifies a Northern Italian Romanesque-style common to Lombardy. Many local commercial concerns have been headquartered in this district, among them, Kaufmann's Bakery still operates on Fillmore Avenue. Nearby is the former Trico Plant #2, which manufactured automobile windshield wipers for decades. This Buffalo neighborhood centers on South Park Avenue. The I-90 Thruway runs along the northern side, and the Buffalo River forms the southern boundary of this industrial district. The First Ward is bordered by Downtown and the East Side. Many streets take their names from states, such as Tennessee St., Kentucky St., Mississippi St., and Illinois St.
Perry St. (N); Smith St. (E);Buffalo River (S); Illinois St (W). Until the 1960s, Buffalo was first in the world for grain refining. Now aging elevators await their fate. The Old First Ward was settled in the nineteenth century by Irish immigrants who worked in the local coal and lumber yards, and most notably the grain elevators along the Buffalo River. Small houses line streets with such names as Alabama, Louisiana, and Ohio. The Irish-American population went to St. Bridget's Roman Catholic Church and school on the corner of Fulton and Louisiana Streets. After St. Bridget's was demolished, the neighborhood's spiritual center became Our Lady of Perpetual Help on O'Connell Avenue. Today the neighborhood is in transition as its ethnic population diversifies. Photographs with "4" in lower right by David Freundschuh and Olivia Christman, who also supplied portions of the text. If you have more to share on this neighborhood, please contact us. This Buffalo neighborhood centers on High Street, with the "33" (Kensington Expressway) enclosing the southern boundary of the Fruit Belt. Jefferson Avenue runs along the East Side, but it is Grape, Peach, Orange, and Lemon Streets that gave the name to the district. Cherry Street was once part of this neighborhood but the completion of the Kensington Expressway (rte 33) isolated it from the rest of the Fruit Belt. The Futures Academy, Buffalo PS No.37 (295 Carlton), is part of this progressive East Side neighborhood. Mural located on the Moot Senior Citizen Center (76 Orange Street). This Buffalo neighborhood centers on Delevan Avenue from Main Street east to the "33" (Kensington Expressway). Hamlin Road runs east to Humboldt Parkway. This neighborhood is dominated by Canisius College. St. Vincent de Paul, one of the many interesting churches of Buffalo's historical past, is now part of Canisius College. This Buffalo neighborhood centers on High Street east of Main Street. The area known as Hospital Hill is dominated by three medical centers. Buffalo General Hospital has been at this site for over one hundred years. The Roswell Park Cancer Institute is on the south side of the hill going downtown, and the Hauptman-Woodward Medical Research Institute is on High Street. Also at 1021 Main St. is the Research Institute on Addictions. At the bottom of the hill on the western edge of this neighborhood is the Anchor Bar. This bar and grill claims to be the original Home of the "Buffalo Chicken Wing." This Buffalo neighborhood centers on the residential area north of Martin Luther King Jr. Park. As part of the Frederick Law Olmsted Parkway System, this large neighborhood contained "The Parade" (later Humboldt Park) and the 200 foot-wide Humboldt Parkway which connected northward to Delaware Park. At one time largely German and Jewish populations supported many houses of worship in this neighborhood. Many of these religious buildings are still standing but have changed denominational affiliation. They now reflect the neighborhood's African-American cultural identity. The King Memorial is located in Martin Luther King Jr. Park. The neighborhood and the Park were originally named Humboldt Park after Alexander von Humboldt (1769-1859), the noted geographer and explorer. Located near the entrance to the Park, at 1020 Humboldt Parkway, is the Buffalo Museum of Science. This Buffalo neighborhood centers on Clinton Street and is physically enclosed by the Buffalo River on the south and the Thruway 90 on the northwest. This area was established as a German-American area during the last century and is now a Polish-American neighborhood. Streets named Weimar and Weiss are still present, but Beer Street has been re-named Casimir Street. When St. Casimir Catholic Church was built in 1928, it became the heart of this Polish-American neighborhood; it remains so even today. Houghton Park stretches from Clinton Street to the Buffalo River, and is one of the cities best recreational parks. This Buffalo neighborhood centers on Kensington Avenue from Main Street to the city line at Cheektowaga. Bailey Avenue is an important north-south street in the neighborhood. The "33" (Kensington) Expressway cuts this large district in half. Ken/Bailey N.H.S., 1048 Kensington Avenue. Two major hospitals, the Erie County Medical Center and Sisters Hospital (below right), are located within this area. This Buffalo neighborhood centers on Eggert Road in the northeast corner of Buffalo. In the Atlas of the City of Buffalo (American Atlas Co., 1894), this area is named "Kensington Highlands." The street grid shows the residential blocks which still make up this neighborhood of single family houses. This Buffalo neighborhood centers on Niagara Street from City Hall to Porter Avenue. Beginning in 1890, Italian-American immigrants settled this area close to the lake, giving the Lower West Side an Italian cultural identification. This can be seen by the two churches of Holy Cross and St. Anthony of Padua. Mass is still celebrated in Italian at St. Anthony's, but the neighborhood has changed and mass is celebrated in Spanish at Holy Cross. The Lower West Side is currently identified with the Buffalo Hispanic Community. This Buffalo neighborhood centers on Best Street from Michigan to Jefferson Avenue. About 1900, a high school was built at Masten Place, a small hillside park in the district. Today the building houses the City Honors School, known throughout the state for its academic excellence. Also situated on this high ground was a reservoir, the basin upon which the "Rock Pile" (War Memorial Stadium) was built. It is now a large recreational field with a track and baseball diamonds. This Buffalo neighborhood centers on Hertel Avenue from Main Street west to Elmwood Avenue. The city line runs along its border with the village of Kenmore. North Buffalo's south borders along Delaware Park and the Buffalo Zoo. North Buffalo C.D.C., 203 Sanders Street. This neighborhood was traditionally populated with Italian Americans. Throughout the 50’s and 70’s, historically known for Jewish community. North Park is a section of North Buffalo that has many affluent homes and architectural properties, and is distinct from the rest of the area around it. The neighborhood is a stable residential community typified by older duplex homes. Hertel Avenue has always supported a healthy commercial district and today is lined with antique shops, restaurants and Buffalo's most noted movie theater for independent films, the North Park Theatre. View a statistical profile of North Buffalo. The Italian Village Festival was moved to North Buffalo due to the large population there. The festival is considered as one of the five largest street festivals in the United States. North Buffalo has a wide variety of excellent restaurants and small markets offering a diverse selection of foods.Also, a number of bars and night clubs on Hertel Avenue provide many evening entertainment spots. One of these is: the Sterling Pub (147 Hertel Ave). Portions of the text supplied Nikki Pascal and Justin Watt. This Buffalo neighborhood centers on Jewett Avenue from Parkside to Main Street. Parkside Community Association, 2318 Main Street. Parkside was planned as a residential neighborhood in 1883 by Frederick Law Olmsted. The curved streets follow the shape of adjacent Delaware Park. The Episcopalian Church of the Good Shepherd was the first church built in this neighborhood (1888). Among the architectural treasures of Buffalo are several outstanding examples of the work of the architect Frank Lloyd Wright. The Gardener's Cottage demonstrates Wright's design principles in a modest home while the Darwin D. Martin House is a prime example of his renowned prairie style architecture. The Darwin Martin House is currently undergoing total restoration. This Buffalo neighborhood centers on Broadway, which runs through this historic Polish-American area. Fillmore Avenue runs along the western edge, and is part of the larger East Side of Buffalo. Active since 1873, St. Stanislaus is the oldest Polish-American Roman Catholic Church in Western New York. An area landmark, it is the center for ecclesiastical and secular commemorative ceremonies. For more information on Polonia visit the Forgotten Buffalo website. For example, before his papal investiture, Pope John Paul II celebrated mass here. The oldest Polish library in the U.S., the "Polska Czytelnia" (established in 1889) is located in the parish Pitass Center. A few blocks south of the Market is the New York Central Terminal. A monumental railroad terminal built in 1929, it was heavily utilized for troop transport during World War II but has since fallen into disrepair. A volunteer citizens group has lately undertaken a renovation project in hopes of spurring commercial interest in its redevelopment. The Adam Mickiewicz Library and Dramatic Circle at 612 Fillmore Avenue was established in 1895 as a literary and theatrical organization in Buffalo's Polish East-Side. Closed for 17 years, this treasure reopened on September 17, 2011. Additional information and photos are available from the Forgotten Buffalo page. On Broadway and Lombard is the Broadway Market, well-known throughout the year for its fresh food vendors. It is a particularly popular Buffalo shopping center at Easter-time when its stalls are over-flowing with seasonal foods, gifts, and flowers. See more photos and information on Polonia, as well as other East Side neighborhoods. This historic neighborhood had many Buffalo landmark businesses, such as Sattler's on 998 Broadway. This Buffalo neighborhood centers on the intersection of Tonawanda and Ontario Streets. Vulcan Street runs along the northern edge of this area of Northwest Buffalo. Riverside developed as the northern "suburb" of Black Rock early in the 20th century due to the expansion of the trolley system. The area was greatly enhanced by Riverside Park (designed by F.L. Olmsted's landscape architecture firm in 1898) which overlooked the Niagara River. Today the park is used by community residents for sports and neighborhood festivals, notably the Fourth of July carnival and fireworks celebration. St. John the Baptist Roman Catholic Church continues to be the most prominent church in the area and both Tonawanda and Ontario Streets provide retail outlets for the community residents. This residential area circles around Schiller Park. Inside this small city park Scajaquada Creek has been channeled underground and continues west under the city to Forest Lawn Cemetery. Villa Maria College, a large Catholic school, dominates the eastern half of the neighborhood. A local family business, Scharf's Schiller Park Restaurant, draws customers from all over the city of Buffalo for its authentic German cuisine and its famous Friday "fish-fry." See a map and basic vital statistics on Schiller Park. This Buffalo neighborhood centers on Genesee Street and Pine Ridge Road, which is the line between the City of Buffalo and Cheektowaga. Villa Maria College is on the edge of Schiler Park. Christine Baranski, actress and high school graduate of Villa Maria Academy, was born and grew up in the Schilleer Park neighborhood. South Buffalo has a strong Irish-American presence. This Buffalo neighborhood centers on the area south of the Buffalo River. A large district, it extends to the Lackawanna city line on the south; to South Park Avenue on the west; and to the eastern side of Cazenovia Park on the east. Cazenovia Creek / Amber Street / South Park Avenue and Southside Parkway / Hopkins Street, Lilac Street, and the former Delaware, Lackawanna & Western RR line. Religious Institutions. South Buffalo has a wide-variety of churches and religious institutions. This residential neighborhood grew in response to the commercial success of the industrial development in the First Ward. Traditionally Irish-American, the neighborhood retains its celtic flavor in area restaurants, churches, and social clubs. Holy Family Roman Catholic Church, Mercy Hospital of Buffalo and Trocaire College are important community centers. Cazenovia Creek, a tributary of the Buffalo River, winds through the neighborhood and the beautifully landscaped Cazenovia Park. The Buffalo & Erie County Botanical Gardens are located in South Park. This park was also designed by F.L. Olmsted. Note:The Botanical Gardens and the surrounding South Park were previously considered part of Lackawanna; that area is now owned and maintained by Buffalo. Tim Russert, a journalist, recognized for his long-time role on NBC's Meet the Press, grew up in this neighborhood and many times told stories of his Buffalo experience. He has been honored throughout the area with a variety of parks and tributes. See videos on Tim Russert and Buffalo. South Buffalo businesses are primarily restaurants, with an abundance of traditional bars, taverns, and pizza places, though there are some others, including: automobile dealers, mechanics, floral shops, barber shops, and medical centers. Recent national notice has been given to the bar that the late Tim Russert often highlighted as his father's favorite, the present day restaurant and club, the Blackthorn. Photographs with "3" in lower corner by Martin Palczewski and Emmalee Russo, who also supplied portions of the text. This neighborhood is a large residential area south of the Main Street campus of SUNY at Buffalo. This Buffalo neighborhood centers on Main Street from Niagara Falls Blvd. south to LaSalle Avenue. University Heights C.D.C., Gloria Parks Community Center, 3242 Main Street. This area is both a commercial district running along Main Street, and a residential area west of Main Street. Visit the University Heights Community blog for neighborhood activities. Hayes Hall on the UB Main Street (South) campus is located on one of the highest natural sites in the city (between 690 - 700 feet elevation). Abbott Hall maintains its historic E.B.Green facade, but has been completely renovated and now houses UB's Health Sciences Library. This Buffalo Neighborhood centers on Vernon Street, but the area forms a triangle with the borders being Main Street, Amherst Street, and Fairfield Avenue. An isolated neighborhood between roads and along the Transit Line, this has a nice charm and small variety of stores, and diversity of people. This Buffalo neighborhood centers on Grant Street and is one of the largest neighborhoods by area in the city. The West Side runs west from Elmwood Avenue to Lake Erie and north from Porter Avenue to Buffalo State College. West Side Community Services, 161 Vermont Avenue. The West Side is home to many important buildings. Among them is H.H. Richardson's Buffalo Psychiatric Center which is set amidst a parklike setting designed by F.L. Olmsted. Internationally acclaimed for its outstanding acoustical design, Kleinhans Music Hall is home to the Buffalo Philharmonic Orchestra. Other landmarks in the area include: the Peace Bridge (connecting Buffalo to Fort Erie, Ontario); the Connecticut Street Armory; and Trinity Episcopal Church (noted for its outstanding LaFarge and Tiffany stained glass windows). An interesting transportation pattern that has survived thruway construction are part of the F.L. Olmsted-designed Parkway. Bidwell Parkway, which is two hundred feet wide, runs westward to a circle at Richmond Avenue. It continues via Massachusetts and Porter Avenues to Front Park. This neighborhood has a diverse population today including most recently Asian and Southeast Asian residents. Much of the neighborhood has been Italian-American for decades and the Annunciation and Holy Angels Roman Catholic Churches are cultural institutions. Guercio's Market, 250 Grant Street - On Grant Street, Guercio's Market and John's Italian Village Restaurant are traditional meeting places. This Buffalo Neighborhood centers on a small park named Willert, which is close to downtown Buffalo to the West. The surrounding streets are Broadway, Jefferson, and Cedar. Find statistics and data for Willert Park. If you have more to share on this neighborhood, please contact me. This page is updated regularly and will include neighborhood boundaries, more photos, more links, and additional data. If you live in a neighborhood and have photos or other materials that you can share, we would be willing to consider them for addition to this site (credit for photos will be given). Geological Survey (US). Buffalo quadrangle, New York. (Map). (Washington, DC: The Survey, 1948). Geological Survey (US). New York. Erie County. Buffalo Quadrangle. (Map). (Washington, DC: The Survey, 1901). New York. (Buffalo, NY: Prometheus Books, 1990). In addition, materials produced in English 201 (M.E. Schindler) are being incorporated into neighborhood pages from course projects (2010- ). Students are credited on pages relating to their project contributions. Buffalo in Maps. Maps, charts, aerial photos, GIS, and other map resources at UB and on the Internet. Buffalo Public Schools. Complete listing of schools, addresses, programs, photos, and other information. Buffalo Catholic Schools (WNY Catholic Schools website). Search for schools in the region. City of Buffalo Official Website. Churches in Buffalo. Beautiful photographs of many (very many) churches in the Buffalo area. Search by name. Schools of Buffalo. By the author/photographer of the Churches in Buffalo site (above). Beautiful photographs of many (very many) schools in the Buffalo area. Search by name. Forgotten Buffalo. Great emphasis on Buffalo Neighborhoods and their history. Provides tour info and stories, etc. History of the City of Buffalo and Erie County: with Illustrations and Biographical Sketches of Some of its Prominent Men and Pioneers, in Two Volumes. Edited by H. Perry Smith. Syracuse, NY: D. Mason & Co., Publishers, 1884. Online facsimile of the book. Our Buffalo. Graphic map showing some of the neighborhoods. Poorhouses in Erie County. Data and references. List of Street Name Changes in Buffalo. Brief listing of old names and new names. 1894 City of Buffalo Atlas. Property maps of the city. Full-color digital version of the original maps with good resolution (may not work with all browsers). 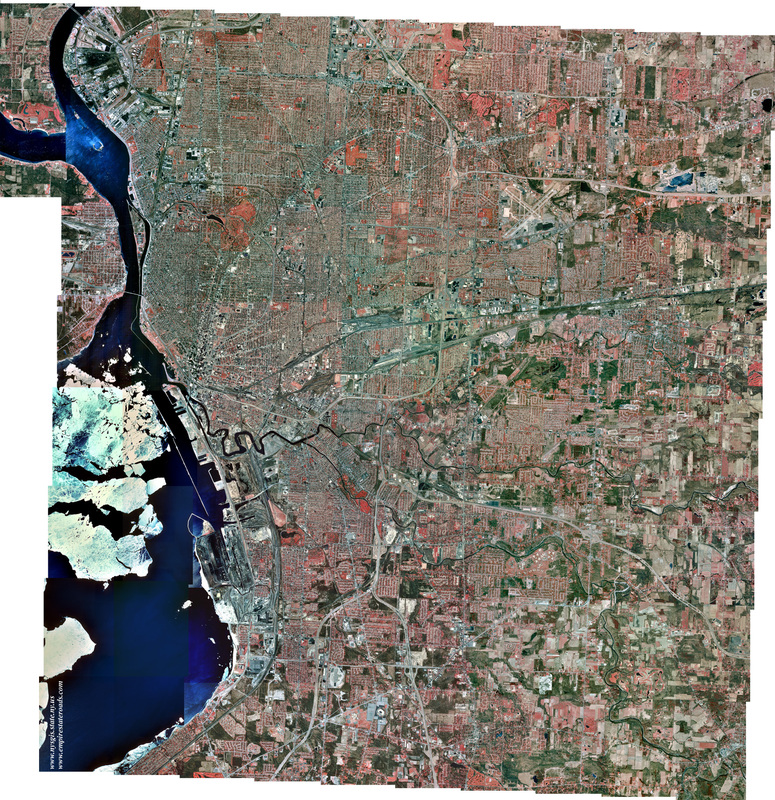 Digital Ortho Photo mosaic of the Greater Buffalo Area. Large image showing the entire metropolitan area. UB Regional Institute. Resources on city development and activity. Buffalo Parks System Map, 1914. Shows Olmsted's designs. Parkways: Lincoln, Bidwell, Chapin, Richmond, Porter, Red Jacket, McKinley. Circles: Soldiers, Gates, Colonial, Ferry, Symphony, McClellan, McKinley. Preservation Buffalo Niagara (PBN) dedicated to fostering historic preservation in the Buffalo Niagara region, serving seven counties in Western New York. Buffalo as an Architectural Museum. Lists websites of existing buildings in Metro Buffalo, including Erie and Niagara Counties in New York State. Has many illustrations and photos. Buffalo in Bloom. Great site on flowers and plants that beautify Buffalo. Also great for emphasis on neighborhoods. Buffalo, New York History. Photographs, drawings, maps, articles; wide variety of topics. Buffalo Spree magazine. Includes articles and resources on neighborhood activities, history, and culture. Built in Buffalo: How to Research Local Architecture. Great starting place for studying Buffalo's rich architectural heritage. Guide to Buffalo English. Partly entertaining, this page does provide a good summary of the "accent" of Buffalonians. Erie Canal website. The Canal had a big part to play in Buffalo history and the old route is now covered beneath the city along the Niagara River. Preservation Resources for Buffalo and Erie County. List of local, regional, state, and national preservation programs and agencies. Fun Stuff @ Buffalo and WNY. Find things to do, places to see, in the region. Visit Buffalo/Niagara page. Information and data on variety of Buffalo area sights and neighborhood activities. Tifft Nature Preserve. Just beyond the Buffalo boundaries but an important site in the effort to revive the city. Buffalo–Niagara Falls Metropolitan Area (Wikipedia). Links to data and text on towns and villages in Erie and Niagara Counties. Western New York 211. Help find health services in eight WNY counties. New York State Thruway Authority maps. Includes detailed map and listing of Buffalo area exits, tolls, etc. WNY Maps. UB Map Collection maps, charts, aerial and satellite photos, and online maps of Western New York, including Erie, Niagara, and other local counties. Boston: A City of Neighborhoods. From full city map, click on each neighborhood to obtain a specific map. Boston Redevelopment Authority Neighborhoods Maps. No complete map but each neighborhood is contained in a pdf that can be enlarged. Albany's Neighborhoods (City of Albany, NY).